Blessed among the Mess: A big finish! I love projects! It's nice to have something to work on that has an actual ending (as opposed to the piles of laundry that seem to never end). Of course, finishing it, is almost as exciting as starting it! The last couple weeks, I have been working on a crib bedding project for one of my nearest and dearest friends, Beana. She has three girls, like me, and wanted something new for bambino number three (Miss Lily). 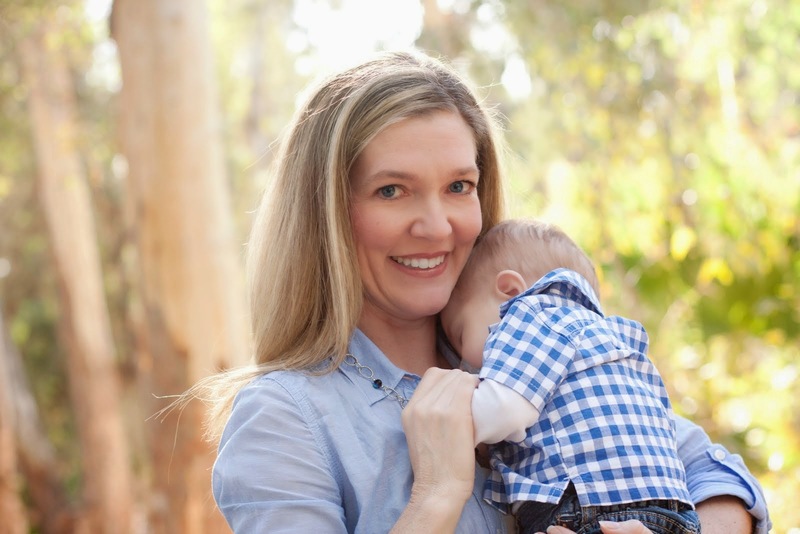 She has a penchant for all things red, so she went looking for a red crib set, only to find that few exist (and those that do are WAY too expensive). She knew that I had run into the same problem with my third (not finding the perfect crib set), so I ended up making my own. She asked me to help her make one for Miss Lily and I was more than happy to oblige. Beana has always been so giving, so I was happy to be able to give back a little something to her. We both perused fabric websites and came up with a few ideas. 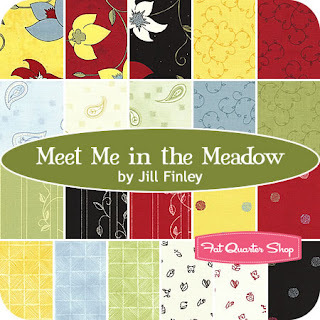 Ultimately, we both just fell in LOVE with Jill Finley's line "Meet Me In the Meadow." Beana picked the red floral, the yellow dot, and the green vines (I picked the red vines to do the binding and ties on the bumper). Since the nursery walls were already yellow, it was a perfect fit! (Sorry about the quality of the pictures. They really do not do this fabric justice. My camera is on it's last leg and flashes whether I want it to or not; even with tons of natural light). I used EVERY last bit that I could. This is literally all I have left (one 8 inch square and some yellow strips). The bumper has all three fabrics in 26 inch sections. The binding is the red vines (as well as the ties). The quilt is my favorite part. Beana and I played with a block layout and she picked the red center. I love how it turned out and think she made the right choice! The red is definitely the highlight here!! After I got it stitched together, I decided to do just an antique triple saddle stitch. I didn't want to do anything freehand that would take away from the beauty of the fabric itself. The rest of the red floral was used for binding (and then washed and dried to make it wrinkly). It was so fun to work on, and equally as fun to be done. Since my creative space is my dining room table, it's always nice to put the machine away (even for a day). Maybe once it is placed in Lily's nursery, she will post pictures of it actually "in use." Today is the last day to enter my giveaway! I will be picking a name tonight and posting tomorrow. Good luck everyone! YAY! I love my sneak peak and am SO excited to see it in person. 6 yards? You little stinker! Thanks for the gift of the other fabric. I think it's so perfect and I will definately share photos of it in use. Now I'm motivated to get the nursery cleaned out and looking perfect for the bedding to be added. It's still a bit of a storage room right now! You are amazing!!! That is beautiful!! Incredible! I love that you guys couldn't find what you wanted and just made it instead! Perfect! You're super talented HJ! That is beautiful!!! I love it!! You are so amazing; you know how to do so many things- I am in awe!! Great job!! It really turned out great. And the best part is that you are giving it away! What a super friend. Thanks for sharing it with me! I love to hear from quilters--Especially ones using my fabrics! Visit me often at my blog because I am having an upcoming give away--details later. Heather! You are amazing! I love the crib set. I had no idea how talented you are! What a way to bless a friend. I love it! Great work! That looks awesome! So impressed! I'm finishing up my first hand stitched quilt. I've never done binding before so if I get stuck, can I email ya for help?